Adam Lambert Has a Homecoming With Faith! You are here: Home / Adam in the Media / Adam Lambert Has a Homecoming With Faith! 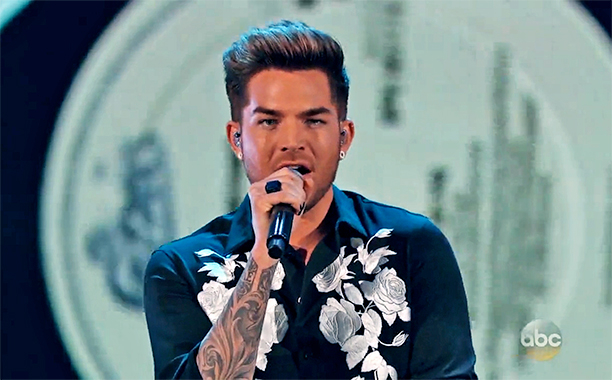 Adam Lambert gave one of the night’s best performances when he owned George Michael’s 1988 hit, Faith on ABC’s Greatest Hits Finale. It was a homecoming because he was accompanied by American Idol’s band leader Ricky Minor, and the back-up singers were made up of Idol vocal coach Dorian Holley and some of the Idol back-up singers. Plus he was on the same stage where the Season 8 Idol finale was held. The reviews are raving about him! My favorite part of his performance? The walk out to the stage and the glance to the camera. I haven’t seen a walk like that since he sang Feeling Good! And his white loafers were as cool as could be! Adam and a few others were the best part of the night. From Lila’s and my viewpoint, the other standouts were Colin Hay from Men At Work and Smashmouth, even though Hunter Hayes’ voice didn’t really blend with the group’s! The worst part? That some of the performances had been filmed previously, so while the pre-recorded videos played on the screens, Lila and I (and the rest of the audience) were watching the stage crew set up for one of the upcoming live performances. In addition to Adam’s live performance, were New Edition, Sheryl Crow (with co-host Kelsea Ballerini), FloRida, Kathy Griffin (comedy routine), Richard Marx, Colin Hay (from Men At Work), Smashmouth (with Hunter Hayes) and Nelly. I guess with that many artists, it’s not hard to believe there may have been scheduling conflicts. Plus, I don’t know if they could have reset the stage that quickly if every artist had been there. On video were Ariana Grande (this was filmed a few hours before the live show and the seat filler organization was begging for attendees to come early to fill the mosh pit & orchestra seats), En Vogue, Celine Dion (co-hosts Arsenio Hall and Kelsea Ballerini did introduce her as “from Montreal” so this was not a surprise) and John Legend. What did you think of the show? A few more Adam/George Michael songs would have been great! But we can’t be selfish, can we?! I saw the lovely Mr Lambert strut onto the stage to sing George Michael, via YouTube. I remember his walk down the stairs on American Idol, which I replayed so many times. Adam owns every stage he steps onto. I’ve seen him live in concert and he is just awesome. He’s wonderful. Love, Tina. Adam Lambert is a force to be reckoned with.. He NEVER disappoints as a performer and a very compassionate Human Being!! There is NO ONE like him now or ever!! SO UNDERRATED and so deserving!! Man can sing ANYTHING and excells in everything he doe! His Compassion and super human energy blow me away everytime!! I aree w/Ms Shar, a rock Adam would be OUT OF THIS WORLD! /ADAM lAMBERT IS A GFG!!! Thanks for sharing this Carol because I missed it. Loved Adam on AI and love him more and more as the years go on. He looks better and better too. My favorite song he has done that was not his is Girl Crush. Lucky for me I have on my DVR and I listen to it all the time. Love that strut. Thank-You for this great article Carol. After all of this time I just now noticed you said music gets you through each day. We have something in common. I couldn’t make it through the day without music either. I have loved Adam Lambert since the first time I sat eyes on him. He is such a handsome man. And so charismatic too. I love the way he walks out on the stage too. I will always wish Adam happiness and a good life! love, love love this guy! I am bummed I missed him on tv, but grateful i got to see it here. He is simply the best there is since David Bowie!